Imagine a giant bonfire, 25 meters high, 20 meters in diameter, and viewed by over 60,000 people. This is exactly the spectacle that will meet your eyes if you happen to be in the town of Novoli, in south-eastern Italy, during this time of the year. This ‘festival of fire’ is known as the Focara, held every year between the 7th and 18th of January. 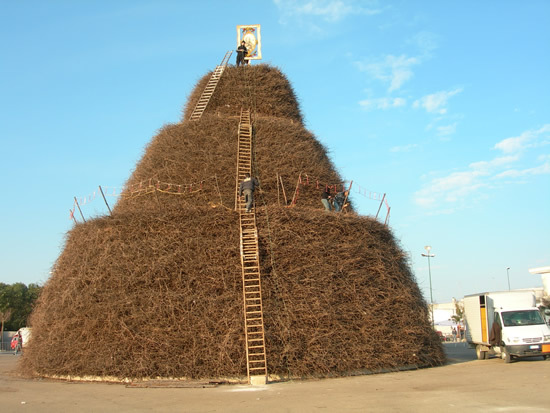 The actual Focara, or bonfire is lit on the 16th, when the festival reaches its crescendo. The tradition has its origins in the pre-Christian era, when it was celebrated to mark the end of winter and the beginning of spring. Today, however, it is dedicated to the memory of St. Anthony, who is the Patron Saint and protector of Novoli. The preparations for the Focara begin as early as mid December. On the 7th of January, the construction of the fuel assembled for the bonfire commences. It consists of bundles of vines that have been set aside by farmers after cutting back vineyards, once the grape harvesting is done the previous autumn. About 90,000 bundles are used, each one consisting of 200 vines. The construction of the structure is supported by wooden beams, and it is erected in Novoli’s Piazza Tito Schipa.